Thank you for the technology. 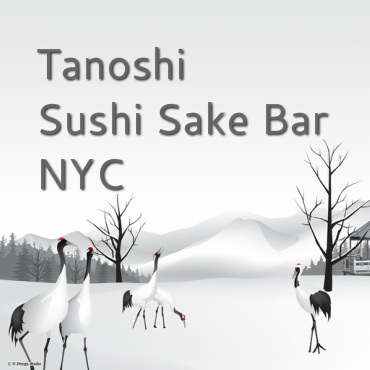 Now, Tanoshi Sushi is receiving the reservation via seatme.com from their website. Please note, that it is rarely possible to have walk in customer in 12 seat sushi bar. There are two rounds every night only. It was before this blog was created and way before this place become popular. We came earlier to write our name in the board and did a little sightseeing in this area. Thanks for the good weather to do this even it was cold. We had about 10 pieces sushi, 3 piece roll and one handroll. Of course, there is a miso soup and a tiny complimentary starter. Tanoshi sushi is BYOB. We do not bother to buy sake or any alcohol even there is a liquor store 1 block away. The sushi is good enough (size), neither too big or too small. The cut is moderate thin. Mr. Toshio will serve your sushi by himself with two helper. His sushi style has light topping; yuzu, scallion, ginger or just soy sauce. Therefore, you may taste the original flavor of the fish. There are few fancy fishes including anago sea eel, botan ebi, king salmon, and uni. He always write down the fancy fish name on the wall anyway. No soy sauce needed. What special with Tanoshi is the rice. He explained in his website that he used a red vinegar (akazu) to make it the sushi rice sweet and refreshing. Also, he mixed the soy sauce to have them different than other sushi restaurant. There is no fancy decor or good looking shirt for the staff. Personally, I think the omakase is a great deal. However, we received a "little upgrade" from the standard fish. Tanoshi sushi is a great place for omakase beginner with BYOB policy. The expert may find other place after eating the first time. Yes, Tanoshi is still serving a great sushi and fresh. No menu. Only omakase is served. The price is between $80 - $90. There are few appetizers that they write on the wall. Uni and quail egg. Mr. Toshi always served this item. It was great combination. He is always using sea eel instead fresh water eel.